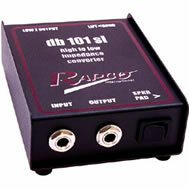 DI-Boxes or direct-input boxes, are devices that convert high level impedance levels to low impedance levels. They are great for amplifying sound from instruments with pickups and for instruments that can’t be miked as easily. In a church setting, they are typically used to connect an acoustic guitar, bass guitar and synthesizers (or electric pianos) to the soundboard. They are physically a small piece of hardware and can stay sit on the stage next to the musician. It is important that every church, regardless of its size, invests in a few of these DI units. DI boxes have a number of different inputs and outputs, depending on the units that your church has. DI boxes normally have clearly marked inputs and outputs and plugging instruments into DI boxes is a very easy task. Once the instrument is plugged in by using a quarter inch cable (or patch cable), it goes through the DI box; and then outputted through to the soundboard. A microphone cable is normally required as the output method because it is a balanced signal cable. What Should And Shouldn’t Be Used? Acoustic guitars, bass guitars and electric keyboards are the most common instruments used by DI-boxes. It is best before hooking up DI-boxes to instruments, to check that the instruments or amps don’t have built in DI units. It is ideal to use the built in DI units on bass amps and keyboards when available; as this will generate the best sound. The use of DI boxes for electric guitars is not preferred. This is because much of an electric guitar’s tone is produced through its amplifier. DI boxes have been known for downgrading electrical signals from electric guitars and making the natural tone of the guitar muddy. It is best to use a microphone for amplifying electric guitars. Check out this detailed description on How to mic electric guitar amps, for more information. The cost of DI boxes are relatively appropriate. Depending on the quality of the unit you are looking for; will of course decide the price it will cost. For simple, low profile designs; will run between $20-$50. Having at least 3 to 5 DI boxes is a good idea for all church applications, to ensure that there will be one for each instrument needed. DI-boxes are defiantly a must have in all church worship applications. In a typical worship rock environment, up to 5 DI boxes are used. Make sure you only use a DI box when needed, as Di-ing some instruments can cause poor tone and sound to those instruments.